any of a group of lung diseases resulting from inhalation of particles of industrial substances, particularly inorganic dusts such as the dust of iron ore or coal, and permanent deposition of substantial amounts of such particles in the lungs. The diseases vary in severity but all are occupational diseases, acquired by workers in the course of their jobs. Symptoms include shortness of breath, chronic cough, and expectoration of mucus containing the offending particles. Silicosis is probably the best known and most severe of these diseases. asbestosis, caused by inhalation of asbestos fibers, is probably second only to silicosis in severity. Prevention and early diagnosis are important, for no effective treatment is available. Coal workers' pneumoconiosis, or black lung, usually in the form of bituminosis or anthracosilicosis, is caused by the inhalation of coal dust, often with silica, and is similar in its development and its effects to silicosis. Berylliosis is a variety found in workers exposed to beryllium in the manufacture of fluorescent lamps, and in members of their families who are contaminated by the chemicals in the worker's clothing. Other types of pneumoconiosis include aluminosis, cadmiosis, and siderosis. talc pneumoconiosis a type of silicatosis caused by the inhalation of talc; symptoms include shortness of breath, cough, fatigue, weakness, and weight loss. Prolonged exposure may result in pulmonary fibrosis. Called also talcosis. Inflammation commonly leading to fibrosis of the lungs caused by the inhalation of dust incident to various occupations; characterized by pain in the chest, cough with little or no expectoration, dyspnea, reduced thoracic excursion, sometimes cyanosis, and fatigue after slight exertion; often leads to chronic restrictive lung disease as measured by pulmonary testing; degree of disability depends on the types of particles inhaled, as well as the level of exposure to them. /pneu·mo·co·ni·o·sis/ (-ko″ne-o´sis) deposition of large amounts of dust or other particulate matter in the lungs, causing a tissue reaction, usually in workers in certain occupations and in residents of areas with excessive particulates in the air; there are many types, including anthracosis, asbestosis, bituminosis, and silicosis. coal workers' pneumoconiosis black lung; a form caused by deposition of coal dust in the lungs, usually characterized by centrilobular emphysema. 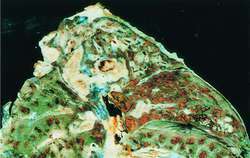 Different varieties of coal have different risks; bituminosis is usually more severe than anthracosis. talc pneumoconiosis talcosis; a type of silicatosis caused by the inhalation of talc; prolonged exposure may result in pulmonary fibrosis. Any of several, usually occupational diseases of the lungs, such as asbestosis or silicosis, caused by prolonged inhalation of especially mineral or metallic dust particles. pneu′mo·co′ni·ot′ic (-ŏt′ĭk) adj. & n.
any disease of the lung caused by chronic inhalation of dust, usually mineral dust of occupational or environmental origin. Some kinds of pneumoconioses are anthracosis, asbestosis, silicosis. Inflammation commonly leading to fibrosis of the lungs caused by the inhalation of dust in various occupations; characterized by pain in the chest, cough with little or no expectoration, dyspnea, reduced thoracic excursion, sometimes cyanosis, and fatigue after slight exertion; degree of disability depends on the types of particles inhaled, as well as the level of exposure to them. Any of a group of conditions in which a mineral dust, such as asbestos, bauxite, coal dust, diatomite, granite dust, quartz, silicon or talc, has accumulated in the lungs. The significance depends on the material and the particle size. Pneumoconiosis may cause severe lung damage with scarring (FIBROSIS) that may interfere with lung function. It may also lead to secondary HEART FAILURE and an increased risk of TUBERCULOSIS and lung cancer. See ANTHRACOSIS, ASBESTOSIS, SILICOSIS, SIDEROSIS. Any chronic lung disease caused by inhaling particles of silica or similar substances that lead to loss of lung function. Inflammation commonly leading to lung fibrosis caused by inhalation of dust incident to various occupations; characterized by chest pain, cough with little or no expectoration, dyspnea, reduced thoracic excursion, sometimes cyanosis, and fatigue after slight exertion. any disease of the lung caused by chronic inhalation of dust, usually mineral dusts of occupational or environmental origin. The principal agents include coal, cotton, sand, and asbestos. n an opportunistic infection found in immunocompromised patients such as those with AIDS. any of a group of lung diseases resulting from inhalation of particles of industrial substances, such as the dust of iron ore or coal, and permanent deposition of substantial amounts of such particles in the lungs. The disease is rare in animals unless there is an unusual exposure to a dusty environment. Horses are the ones most commonly exposed, usually in a mining operation (pit ponies). Exercise intolerance and chronic cough are the cardinal signs.